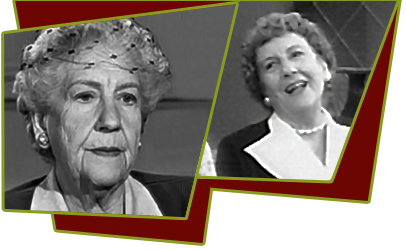 Born in Montana in 1892, Kathryn Card was best known for playing Mrs. McGillicuddy, Lucy's mother in the I Love Lucy series from 1955-56. She was a stage, radio and television actress. Her first film was "Kiss and Tell" (1945). She played in many movies since that time. Her last film, "The Unsinkable Molly Brown" (1964) she played Mrs. Wadlington. Card did radio roles in the late 1930s, notably Uncle Walter's Doghouse, broadcast on NBC from 1939 to 1942. She played Grandma Barton in The Bartons. In 1943, she was a cast member of Helpmate, a daytime serial on NBC. Her first screen credit was in 1945 for her role as Louise in the Corliss Archer movie Kiss and Tell, starring Shirley Temple as Corliss Archer. On February 8, 1954, Card made her first television appearance in an episode of I Love Lucy. The installment, entitled "Fan Magazine Interview", featured Card playing a slatternly woman named Minnie Finch. The following year she was cast as a totally different character, Mrs. McGillicuddy, Lucy's mother. She joined the Ricardos and the Mertzes in Hollywood when Lucy's husband, Ricky Ricardo, was given the opportunity to star in a motion picture. She portrayed that character in five episodes during the 1954-1955 season, and appeared in three more installments during the 1955-1956 season when the Ricardos and the Mertzes traveled to Europe. She reprised that role for the last time in one episode of The Lucille Ball-Desi Arnaz Show entitled "The Ricardos Go To Japan", in 1959. She also appeared in many television shows after I Love Lucy including "Alfred Hitchcock Presents", "How to Marry a Millionaire", "Perry Mason", "Wagon Train", "Rawhide" and "The Virginian". She died of a Heart attack in March 1964 at the age of 71. She is interred in Harbor Lawn-Mount Olive Memorial Park in Costa Mesa, California.